iCollector.com is welcoming McKenzie’s Associated Auctioneers to their live internet bidding platform this month. They are running a series of auctions including a very important selection of quality watches, fine handbags and women’s wear up for grabs on June 13th. This sale brings a live online auction with one of the best groups of fine watches to show online this year. Presented is an auction of quality and refinement with incredible buys that are far below even the best wholesale pricing. All bidders can leave their maximum bids online anytime or join the live auction on the 13th; with every item going down to the auction hammer with an incredible buy. Lot 1 starts off the auction with an incredible Rolex Daytona 18K Rose Gold Watch. This comes with a leather strap and solid 18k chrono pushers and winding crown. It carries serial number U70F0662IN, and the current replacement value of a watch of this quality is $35,000 and bidding opens at only $500. Next up on the auction block at Lot 2 is another Men’s Rolex and this is a Submariner Watch. It is in stainless steel with a steel Rolex oyster bracelet. The crystal is sapphire and it has a beautiful black dial with luminous markers and hands. This is a great value and its replacement value is around $11,000, making the final auction price one of the best values of the auction. Both watches have photos and full descriptions available in the online catalog. Lot number 6 is one of the most beautiful watches in the auction catalog. 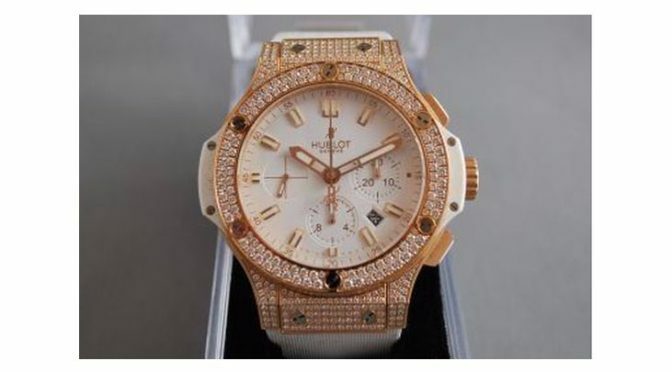 Presented here is a Hublot Big Bang Chronograph Watch that is made with 18K Rose Gold and is a 41mm Unisex wristwatch. There is an automatic chronograph movement with a lovely white dial, and three sundials and date are included. The watch is fully diamond set and is fitted with a white rubber bracelet with an 18K Rose Gold deployment buckle. This watch will impress anyone who sees it and a watch of this kind can carry a replacement value of up to $45,000. This stunning watch comes to the auction block with an opening bid of only $500 and bidders will rush to get their hands on this one. Some stunning purses and handbangs are up for auction as well. Lot 16 is a spectacular Louis Vuitton purse that is a must buy for those with quality interest. There are several photos in the online catalog and this opens at $500 with someone taking home an incredible purse for a rock bottom price. Further up at Lot 19 is another highlighted handbag, this one is from Hermes and is brown in color. It will also open for $500 and has an array of photos online for inspection. This auction also has an incredible pair of size 38 Jimmy Choo Ladies Heels up at Lot 13, as well as more watches and some leather coats. McKenzie’s Associated Auctioneers are happy to answer any and all questions and their goal is to deliver fine pieces at deals that can not be found anywhere else. The live auction begins on 7PM Eastern Time on Monday June 13th, 2016 and all bidders who can not attend can leave their maximum bids on iCollector.com anytime up until auction day.